To offer extra security we can offer a keypad entry control which you can set your own security code or change it when required. Ideally suited to venues that require restricted access to other areas of the building. 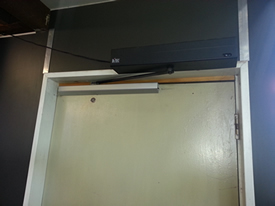 If operating doors is a problem, a simple electric door opener/closer can be fitted to the lift. 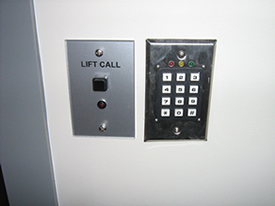 This allows the door to be opened automatically once the lift has been called to that floor. After a preset time the door will automatically close so the lift can be operated. If the door strikes an obstacle it will automatically return to its starting position. Quinn Engineering are trialing an Integrated Soft Start/Stop system for all through floor lifts that should be available in the near future. This will be an optional extra that will be best fitted during installation but will also be able to be installed to most of the later model existing Quinn lifts.